Within the range of professional cleaning, Corazzi Fibre is introducing the new line of melamine floor pads for thorough cleaning and upkeep of porcelain stoneware and porous stone floors. The high cleaning power of melamine effectively decreases the use of chemical products. 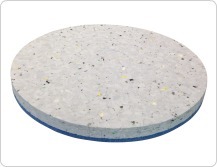 Every melamine floor pad Corazzi is coupled with a blue backing to make its anchoring to the pad holder easier as well as to increase its duration of use. To receive further information about this new item brought to the professional cleaning market by Corazzi, please fill the form “Contact us ” at the bottom of this page.